If you’re running an e-commerce site, you’ll know it’s all about getting virtual feet through your online door. While there are many ways to do this, search engine optimisation (SEO) is one of the best. This introduction to SEO for e-commerce will help you understand why and provide you with an overview of what’s involved. Short for Search Engine Optimisation, SEO is a specific and highly-targeted method of enhancing your website, including its content, architecture and links, so that search engines may improve the ranking of the pages of your website. What exactly is a search engine then? In a nutshell, search engines like Google, Yahoo and Bing are all information retrieval systems. Their purpose is to help searchers find what they are looking for as quickly as possible. Depending on the search query (the word or phrase that is typed in), search engines aim to provide the most relevant and authoritative information for their users. Say the search query is ‘red shoes’ and you want it to serve up your “red shoes” information. To achieve this, you need to anticipate the searcher’s intent and make sure you have the relevant copy (words) on your website. This is based on how many other quality sites are giving you a “thumbs up” by putting links to your site (i.e. backlinks) on theirs. So, SEO is a way to align the search phrases that potential customers may use with your content and architecture. You also need to build authoritative links and satisfy the technical aspects search engines use to crawl and index your site. When you do this right, you make it easy for search engine users to find you. Why is SEO important for an e-commerce site? Millions of people use search engines each day to help them find the answers and solutions they need. In fact, 93% of all online experiences begin with search engines. There is a wealth of competition out there, and most search engine users will only explore the top 5 results in the search ranking. If you appear lower down than that, there’s a good chance they won’t even see you. It’s also worth bearing in mind that people trust organic search results more than ones that have been paid for. They therefore often ignore the paid options and go straight to those they know Google (and by default other users) have ranked highly. Many people think that because SEO results in organic traffic, also called ‘free’ traffic, that it doesn’t cost anything. This isn’t entirely true. While you aren’t paying for clicks or impressions, you do need to invest time and money into the architecture of your site and the quality and structure of your content. Your aim is to create a long-term, sustainable stream of quality visitors to your e-commerce website. The visitors you gain through SEO are usually already interested in your product and very ready to buy – so you have less convincing to do from your side. As a result, this is one of the most worthwhile investments you can make in your online business. 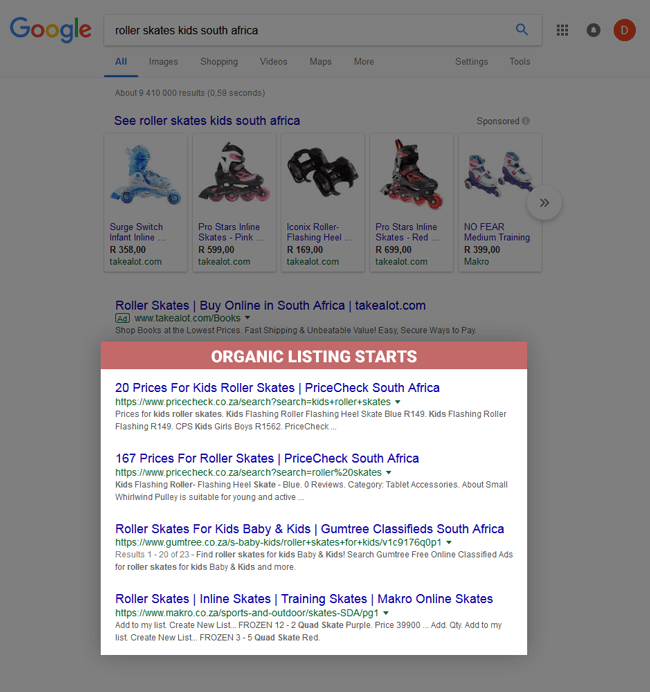 If you search for roller skates for kids in South Africa, a number of options pop up. First, you see the sponsored options (i.e. paid ads), which you might glance at, but most likely you will skip to the listings below them. These have been ranked highly by Google due to their relevance to your search term, as well as over 200 other factors, like the site’s age and the traffic passing through it. Because of this, you can safely assume these sites are likely to satisfy your search intent to a high degree. If you’re new to SEO, it can seem complex – especially as you need to revisit your strategy regularly to make sure you stay competitive. That’s why we recommend you bring SEO experts on board. Whether you hire SEO specialists or do it yourself though, this basic framework will help you make sense of the concepts. Find the top keywords for your industry, products and services and build your site around them. Address technical issues like responsiveness, speed, access and so forth to make sure your site fulfils all the requirements for ranking highly. Apply your keyword research to the most important parts of your website and content. Then web users will be able to find you and search engines can understand and index your site. Promote your website and content so related sites link to you (back-links). This shows you are valued by other authoritative sites, thereby increasing your ranking. The aim here is to find out what keywords are being used by people searching for your type of products and services. Start by checking the keywords your competitors are using as you are obviously trying to attract the same customers. Tip: Create a spreadsheet with your site’s current/proposed URLs. Ask an expert to research main/head keywords and then allocate them per page. Supplement these with long-tail and semantic keywords, as well as synonyms. Ensure your keywords are unique across pages. 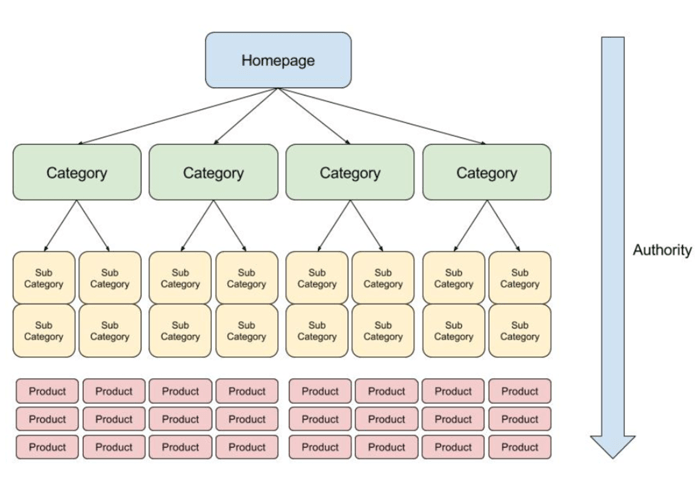 “Site architecture” describes how the pages are linked to each other, as well as the organisation of your hierarchy. Your site structure needs to be simple and easy to navigate, with visitors never more than a couple of clicks away from your home page. In other words, keep the structure as shallow as possible. Tip: Base all URLs on your keywords. Relevant keywords will take you far, but if search engines can’t easily crawl your site, they will not be able to index your pages. Tip: Comalytics can do an SEO and speed audit to identify any SEO errors, so you (or us) can correct them. Tip: Website responsiveness is a very important factor. Speak to us if you need to re-platform. All the important parts of your site, including the title tags, headings and content of category, product and blog pages, need to use your keywords. They should also appear in all your image alt texts. 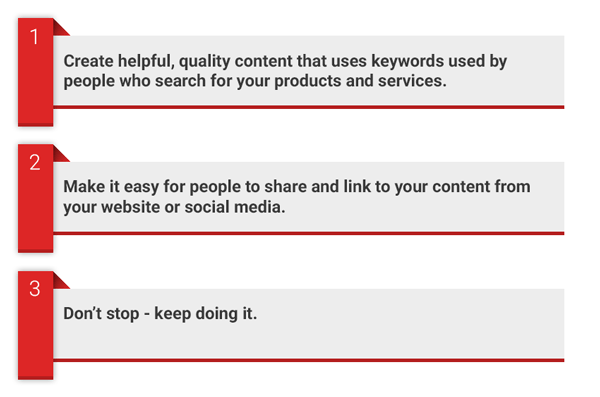 Use them in meta descriptions too – although Google doesn’t use this aspect, it helps customers understand relevance and encourages them to click through to your page. Tip: Most platforms come with some SEO features built in. Make sure you know what is done ‘out of the box’ by your platform, and which areas need to be addressed by an expert. Tip: Search engines require title tags for category and product pages to be unique. Use your URL/keyword spreadsheet to keep track of this. Google uses the opinions of other sites to help rank you. It does this by checking how many other (reputable) websites link though to yours, indicating that they consider you an authority. Including excellent quality content on your site is a good way to achieve this. With great quality content, you can begin building interest and loyal followers. Encouraging them to share your (optimised) posts and to link to your site will further increase your authority. If you have a physical outlet, you can use ‘local SEO’ to drive local traffic to your store. If you are a national retailer, you may even want to invest time and money in a local SEO strategy for each of your stores. This will ensure they are known locally and visited ahead of competitors. Web page rankings:How well do pages rank for main keywords and do visitors click through to your pages. Organic search performance: Increase in organic impressions, organic traffic and organic click through rate. Indexed pages: Monitor that all the correct pages are available for Google to crawl and index. Do this by optimizing robot.txt and sitemap files. Remember that SEO is there to help you be relevant and useful to your customers. Essentially, all your ongoing efforts should be aimed at helping your customers buy from you. Start small but put the elements of success in place early on. Then simply focus on writing helpful descriptions and blogs with your ideal customers in mind. To increase your e-commerce sales, you need to improve your search engine ranking so more of your ideal customers can find you. Begin by making sure you understand the basic concepts of SEO, then either apply them yourself or hire an expert to do it for you. Bear in mind that an SEO strategy isn’t an overnight process – it takes ongoing work. If you keep putting in the effort though, you’ll start to see the results: organic, quality traffic to your site.